If you think Britain is a postage-stamp-sized country, compared to Australia, then Ireland is even smaller, but it's loaded with terrific locations, beautiful countryside, great pubs and fantastic locals. Despite the financial gloom from the post-GFC Irish banking meltdown, their spirits were good. 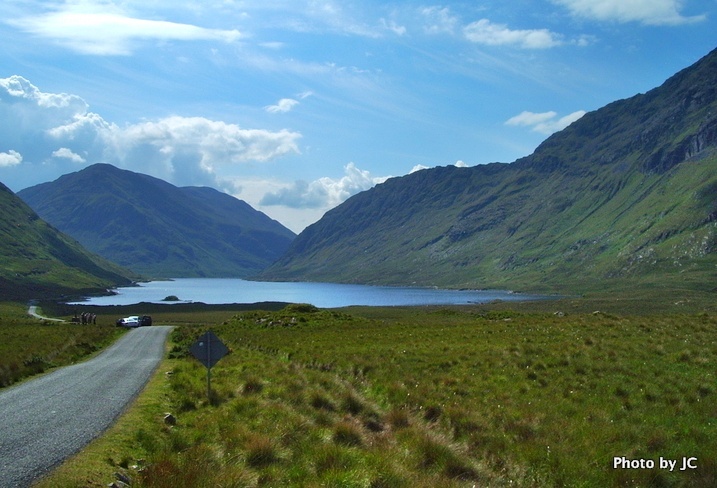 If you've only got four days, how do you make a choice of which part of Ireland to sample, on your first trip? If you take the view that cities are pretty much the same all over the world, then you must head off the beaten track. We chose to fly from London Stansted into Knock, sample the countryside, and fly back to London Gatwick from Shannon. Our overnight stops were in Westport, Galway and Ennis. We chose B&Bs in each location and were never disappointed. After landing at Knock around 10am we drove up to Donegal for lunch. We toured the area, including Donegal Castle (now a conference centre), before heading south to Sligo and Westport. Westport is a truly charming, and busy coastal centre for surrounding residents and farmers. There's a delightful river which splits the town, and some great shops, eating places and pubs. Leaving Westport and travelling down the R335, through Cregganburn, you pass through a wild and desolate area and find a beautiful inland lake, known as Doo Lough. 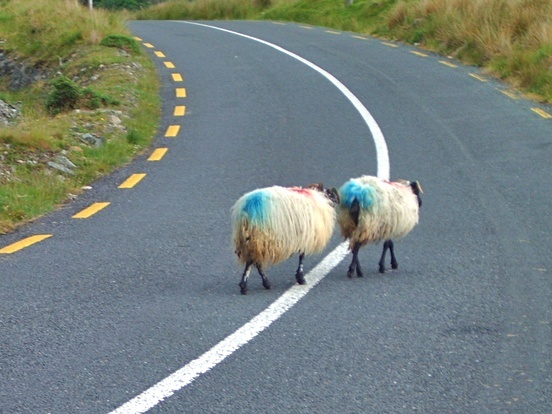 The back roads in Ireland are all narrow, two-lane blacktop, surprisingly posted for 100 km/h! The locals drive that quickly, while the tourists are usually driving slower, on the eveready lookout for wandering sheep, which can confront you around almost any corner. Stopping for lunch in the fishing village of Leenane we continued along the N59, into an area known as Connemara. 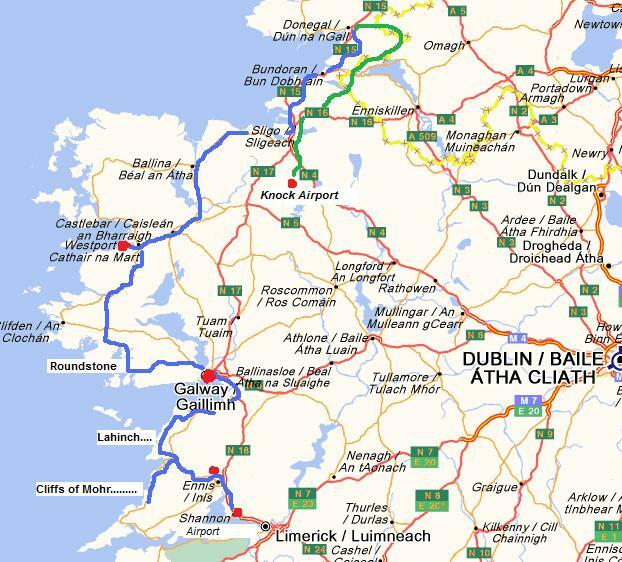 The hilly terrain through this area, looping west and then south, and then east to Galway is beautiful driving. The drive goes through the Maumturk Mountains, which boasts Benbaun at 2993 metres. 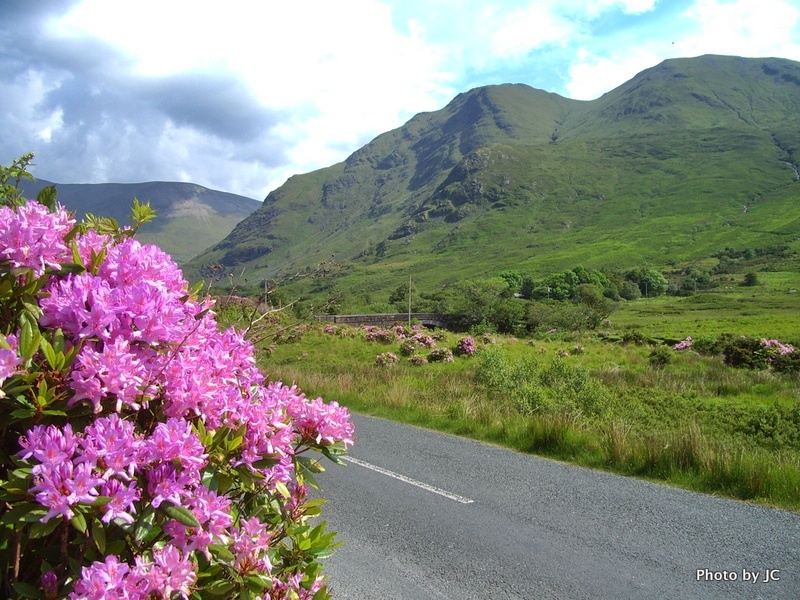 The most amazing color along the way comes from flocks and flocks of wild Rhododendron, their pinky-purple blooms splash the countryside with color. 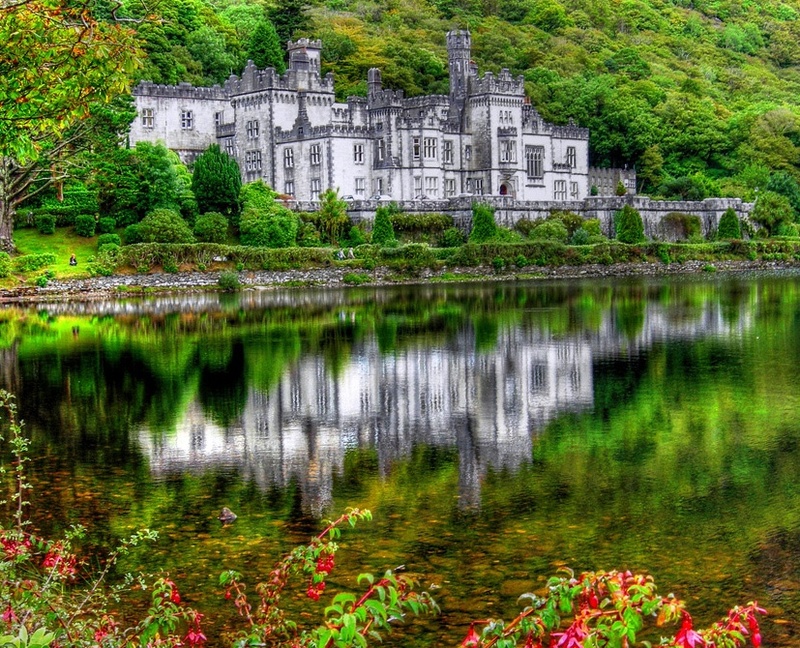 Along the N59, which is part of the Connemara Loop, you come across Kylemore Abbey and Gardens. As you approach, you see it across a lake, framing a great photo. The Loop drops down to the coastline, and a pretty harbour village called Roundstone. 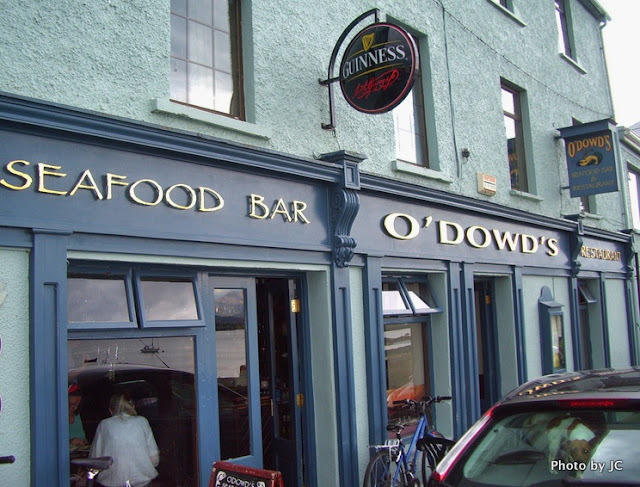 Here, you find one of Ireland's most famous eating places, O'Dowds. Their fish curry made from pieces of Monkfish and Scampi is a real treat! 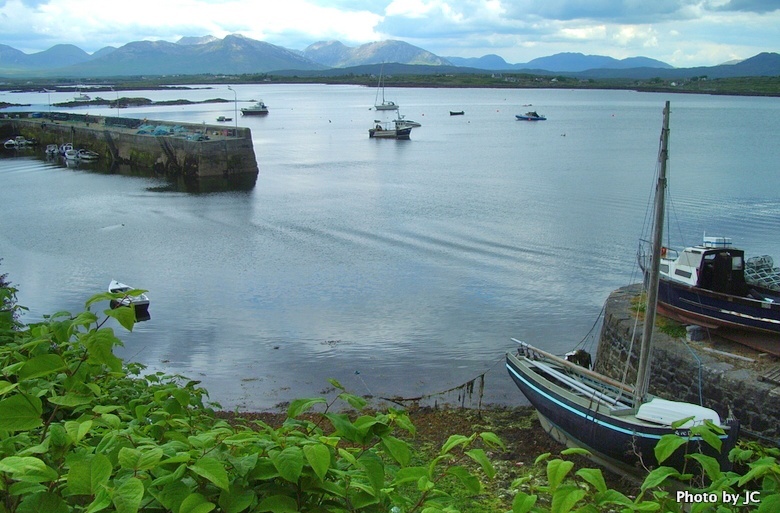 The harbour is a pretty sleepy place looking east towards Lar Connaght. Then it was a night in Galway, which is a large town, with a lot to choose from, but it's certainly not a photographer's paradise. The town has lots of tiny streets and alleys, a confusing one-way system, and on the outskirts there are few sites to tempt the camera out of its bag. So, we headed south and west again, towards the coast, with Dunguaire Castle the first stop. 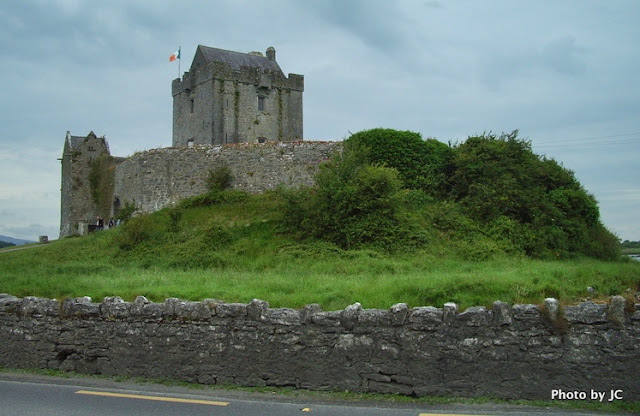 The site was first occupied in 662AD, and this fortified tower house was built in 1592. 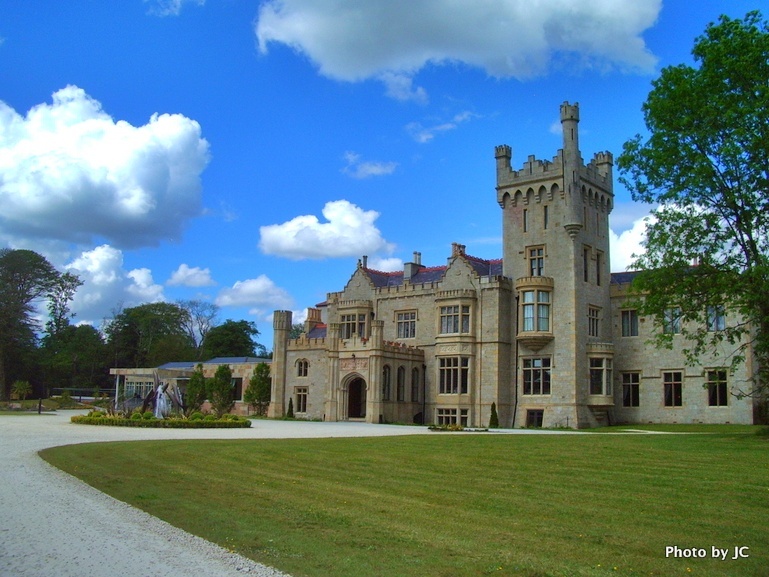 The castle was acquired by Lady Ampthill in 1954 who completed the renovations, and is popular for medieval banquets. It's owned now by the Shannon Free Airport Trust. Then we headed south through an area known locally as The Burren, which is very popular with hillwalkers, photographers and lovers of the great outdoors. From here we headed to Lahinch for lunch. This area along the coast is mildly undulating, and ideal for golf courses. 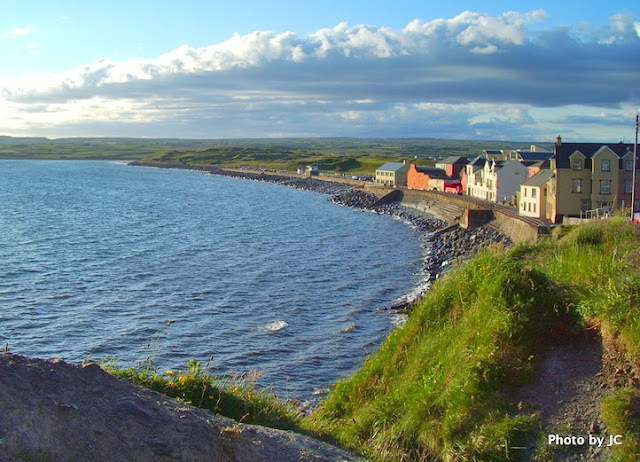 So much so, there are five located around Lahinch; consequently there are a number of golf shops in the town, and lots of American golfers in their plaid pants wandering around. 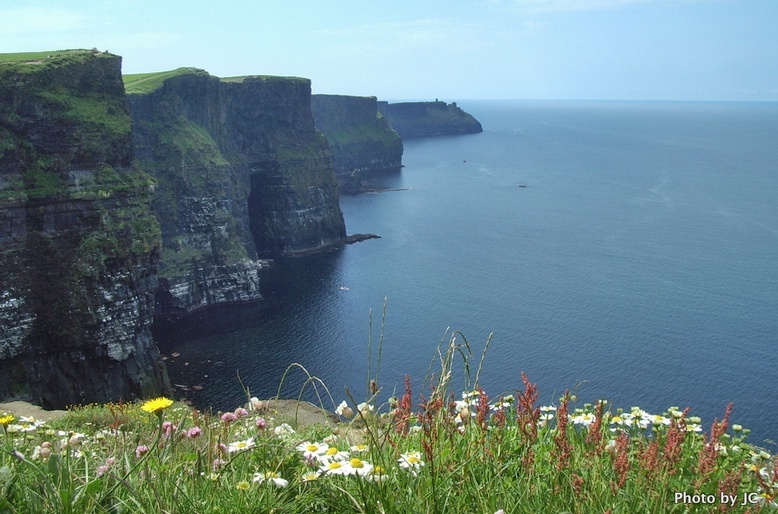 Then it was south to one of the west coast's most popular tourist destinations, known as the Cliffs of Mohr. Definately worth a stop. Spectacular coastline, and great walks. 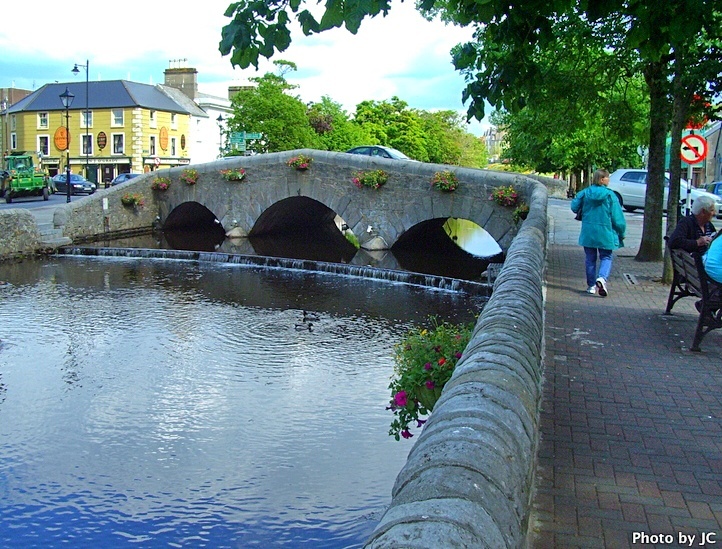 Then we stopped in Ennis for our last night, before dropping our rental car off at Shannon. 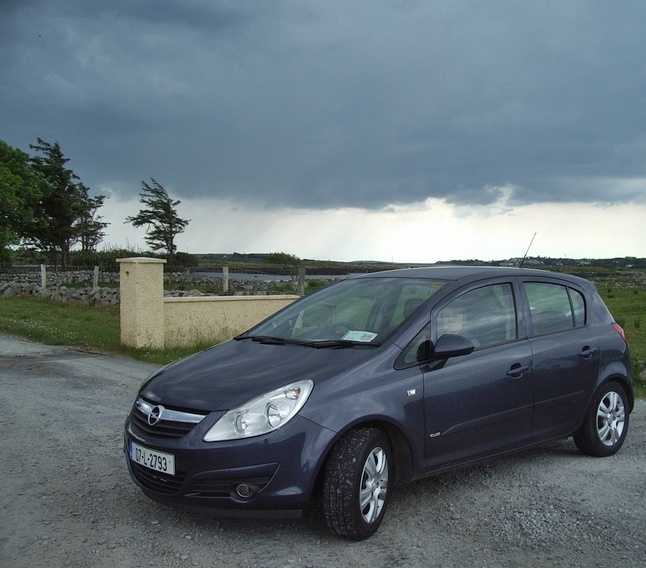 Our vehicle was a very economical 1-litre Opel Astra, which was booked online via Holiday Autos, and delivered from Irish Car Rentals. The rate was good, the car clean and reliable. 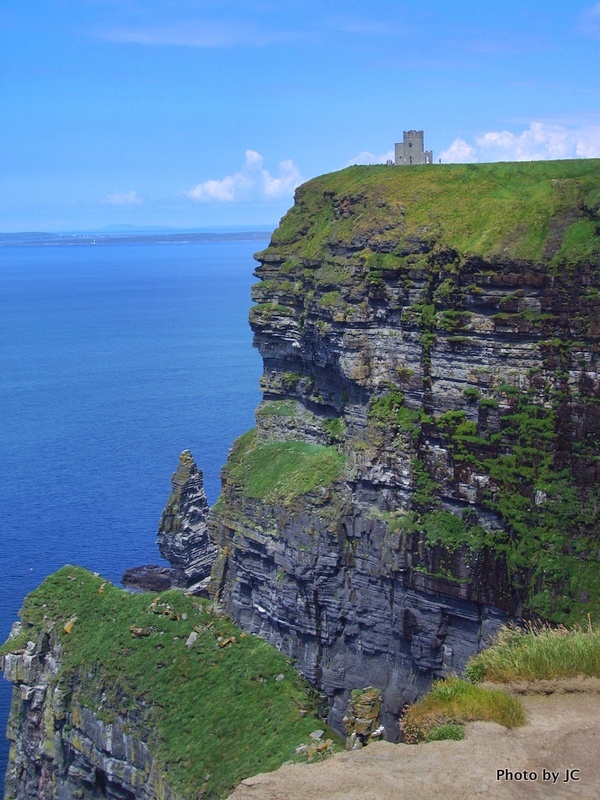 Ireland may be a postage stamp, but if you visit soon, you'll really help the local economy!